SenshiStock USB 2.0 is the second drive release. It includes pose reference images from Shoots 27-37, with the exception of stock that was or will be sold through SenshiStock.com in paid advanced packs. This is a red, 8GB drive with about 2.700 stock images totaling 5.83GB. Approximately 55% (roughly 1,500 poses) of these images are as of yet unreleased in the public DeviantART gallery. The drive includes all of the collab with Jademacalla as well as the complete hand and foot packs. Additional shoots include many themes including: leaning, dancing, crawling, pregnancy, sleepy, sad, laughing, yoga, flute, guns, staff, climbing, skipping, eating, dressing, strong perspective, male refs, magical poses, and many more! In general, USB drives are not great long term storage devices. When you get your USB drive, be sure to back up the files in a more secure location! 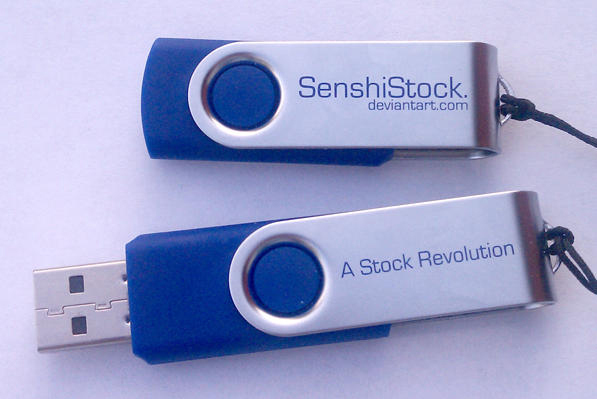 The first SenshiStock USB drive contains nearly 3,000 stock images. It includes all images from the 1st through the 26th shoot. 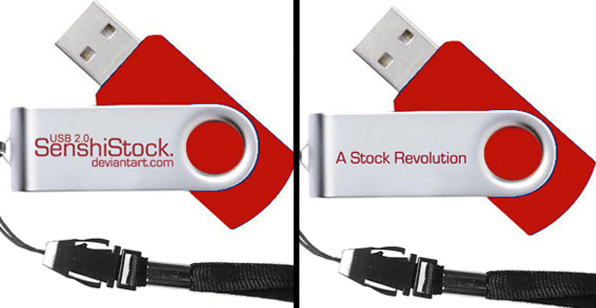 The drives say "SenshiStock" on one side and "A Stock Revolution" on the other side; they come with a lanyard. It's an 8GB drive, but only about half is stock so you have lots of space for WIPs, scans, etc. It includes everything from those shoots in the deviantART gallery, excluding paid stock packs. About 200 of the images on the drive are as of yet unreleased.